Jurassic World was one of the movie we caught during the school holidays. I love the trailer and read that Jurassic World was even better than the original Jurassic Park. That got my expectations up high, since in my opinion, the first instalment of Jurassic Park was a classic. After watching the movie, I was just a little bit disappointed, it's entertaining no doubt, and we all enjoyed the movie, but the sudden ending left me hanging in midair. 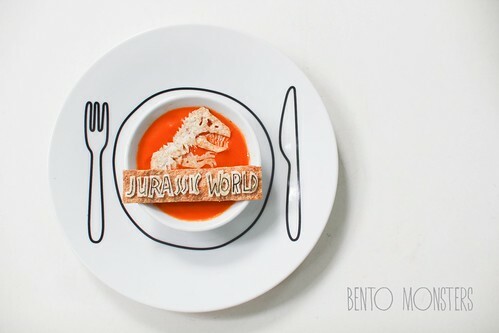 The very next day after we watched the movie, I made this bowl of Jurassic World soup. To make this, I filled a bowl with carrot soup. 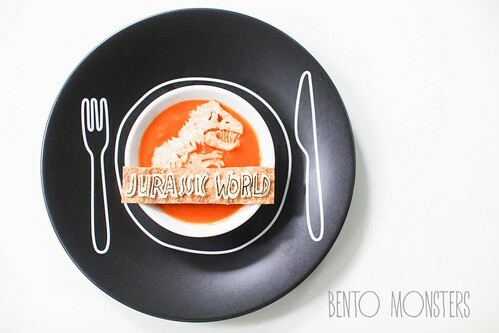 Then, I cut T-Rex and the Jurassic World banner from a slice of wrap. I vary the toasting time of the wrap for the different sections so that there will be some difference in the colour tone. The black portion of the words were cut out from nori. Do catch the movie if you have yet to, it's still good and definitely worth watching. Love the movie too. 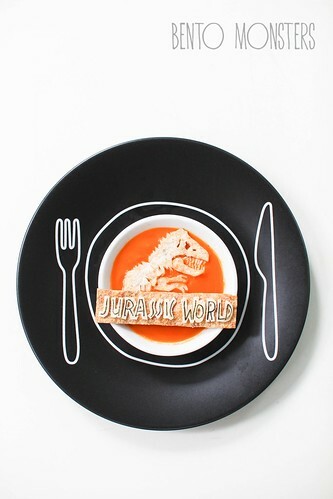 Very nicely made T-Rex!